Soft white bread, lots of mayo and egg salad tucked inside…with the crusts cut off. That is my mum’s dream version of an egg salad sandwich. And who can blame her? That sounds pretty darn good. But in the spirit of lightening things up and looking to the season of bathing suits and pool parties, I made a few changes. Let’s start with the white bread. This one is up to you and there are plenty of options. 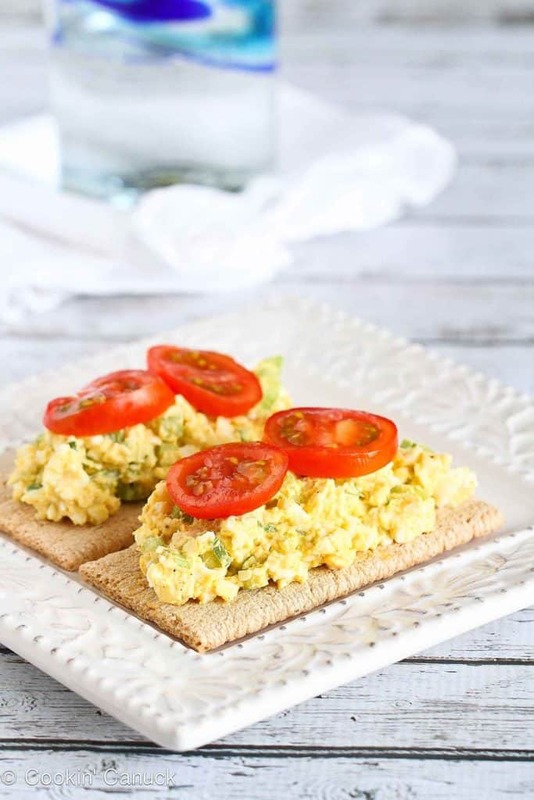 You could serve the light egg salad on whole wheat bread or fiber-filled crackers, such as Wasa. Or avoid the carbs altogether and spread the mixture on cucumber slices (mmm…that would make a good appetizer, too), stalks of celery or on a bed of spinach. Okay, now I’m the first to admit that I love the taste of mayo. Always have…always will. And I know that replacing it with Greek yogurt doesn’t fully make up for the omission. That’s where the curry powder comes in. Spices and herbs are such an integral part of healthy cooking. 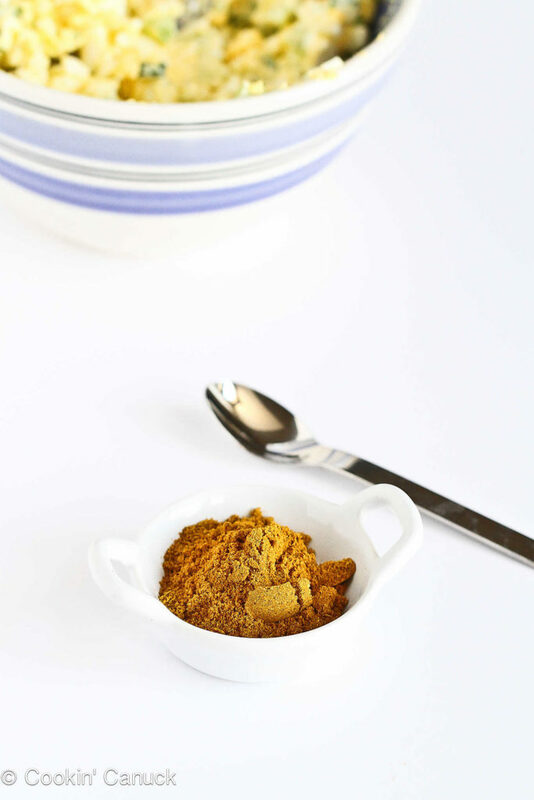 Much of what is lost by omitting fat can be made up for with the natural flavors of herbs and spices. That’s exactly what curry powder does in this case. Whip up a batch of hard-boiled eggs on the weekend, you’ll be able to throw this salad together in 10 minutes during the week. Light and easy! 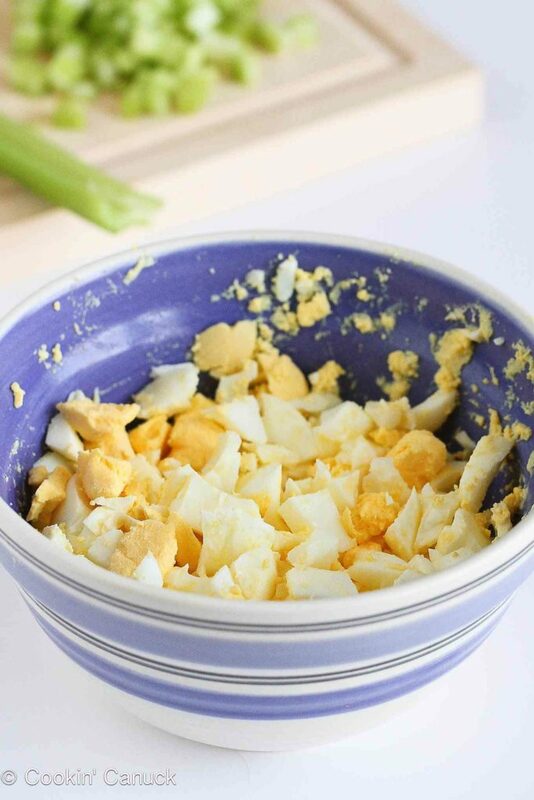 Place the chopped hard-boiled eggs in a medium-sized bowl. Add the celery, green onion, Greek yogurt, curry powder, salt and pepper. Stir to combine. Serve on bread, crackers, cucumber slices or celery stalks. 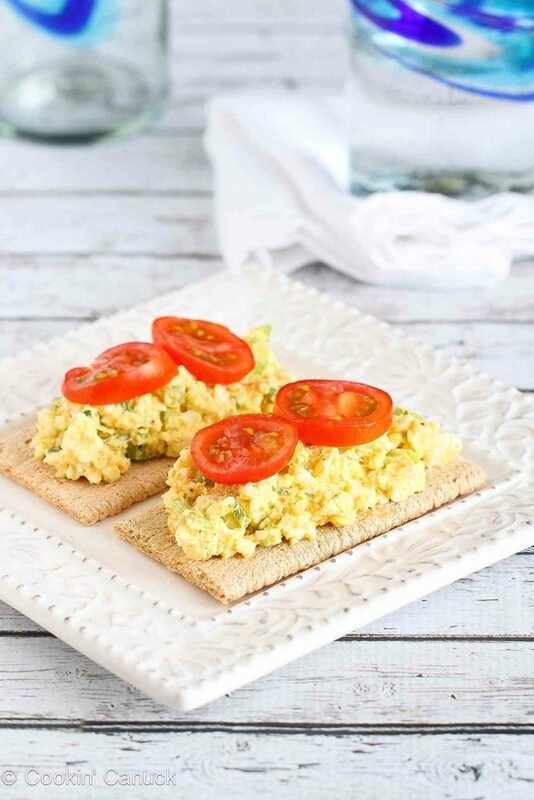 I just love egg salad this time of year, great presentation and pics! Love the idea of serving this on cucumber slices as an appetizer! Love this idea! And I love wasa crackers too. Mayo tastes good but I’m so used not eating it. I find Greek yogurt with apple cider vinegar, salt, pepper and garlic powder comes as close of a replacement for mayo for me. Have a great weekend! This is a great idea for a healthy and tasty lunch and I enjoyed your tips, too, especially the one about adding curry to take away the disappointment, if you like, of the yoghurt not being mayonnaise. I love that! What a great way to use leftover Easter Eggs! I love egg salad as a ‘there’s nothing in the fridge to eat’ type comfort food–and I like it best slightly warm. I’d be all over this salad, with the hit of curry powder. You’re giving me ideas for layered summer salads–this atop a bed of chopped cukes, zukes, carrots and tomatoes? Thank you for the recipe! I’ve been in weight watchers 2 month now and was looking for a light version of my favorite restaurant’s curry egg salad. Your recipe is super good. A batch was enough for breakfast and lunch, eaten alone or on a lettuce leaf, so it was perfect to make before work.